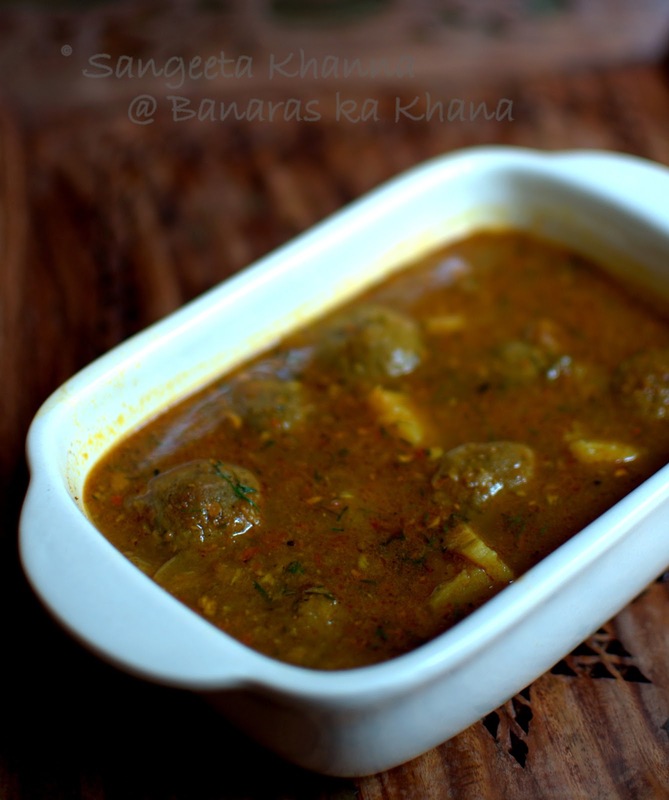 Kele ke kofte is one recipe that gets repeated often and is remembered a lot by almost all my relatives. There is a story behind it. 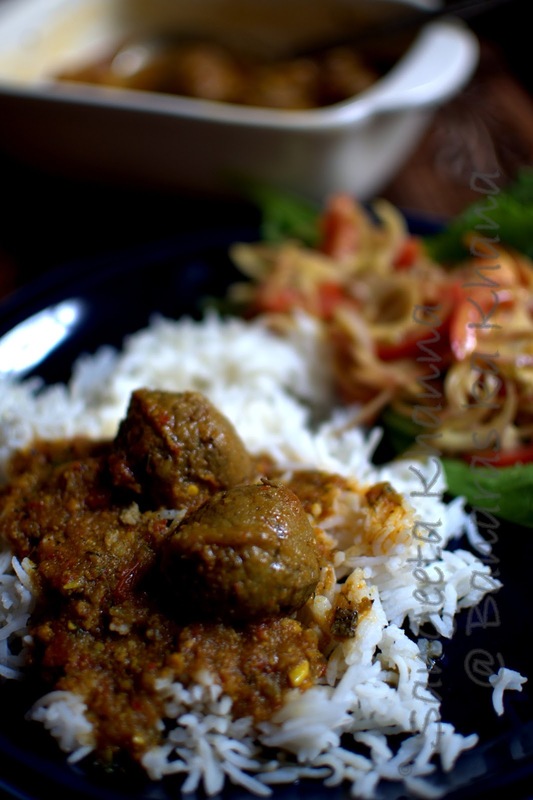 Let me tell you that Kachhe Kele ke kofte is a fried dumpling made using green plantains and is curried into a spicy gravy. 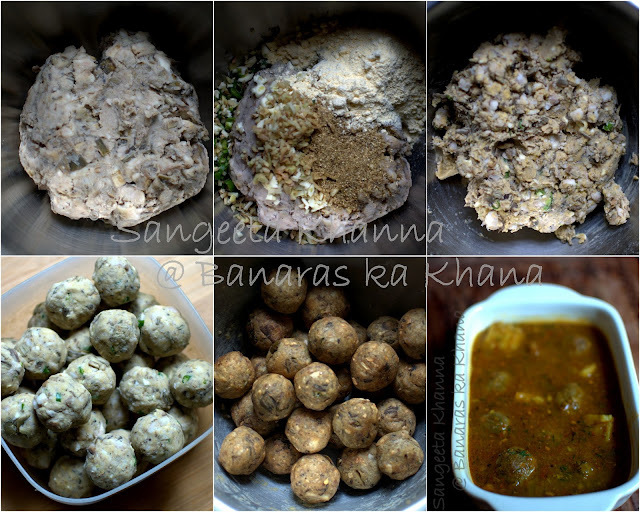 This is one of those UP recipes inspired by Mughlai keema koftas. I remember once when it was my sisters engagement ceremony and the cook disappeared at the last moment. There was utter chaos and my parents were at a loss of words. There was no option but to cook it all by ourselves but there was no one else apart from me and being the eldest in the family I had to take responsibility even though I wasn't too confident to cook for a huge crowd like that. I had to cook for around 50 people and the only helping hand was that of my sister's friend Parmita. She helped me in the preparations but all the actual cooking was dome by your's truly. 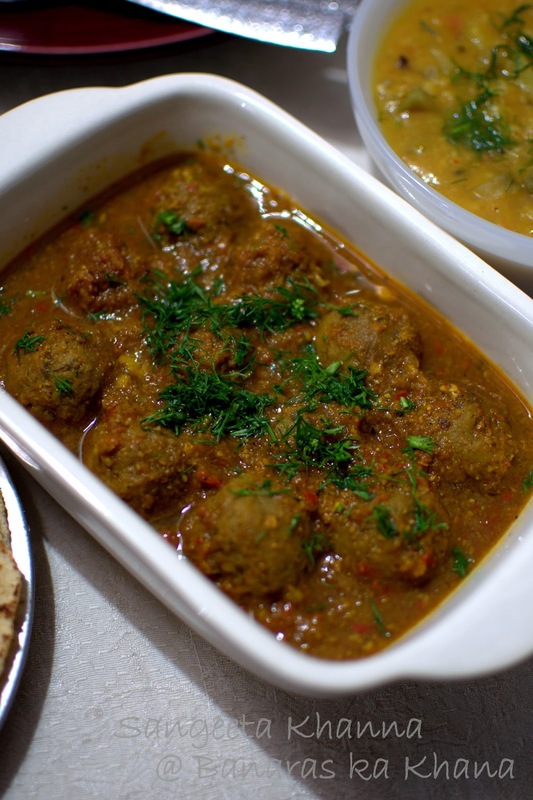 That day I made this kele ka kofta and it turned out so good that most relatives and cousins still remember that and ask me the recipe again and again whenever they get to meet me at some or the other family get together. I also remember, I had made a LOT of kofte that day, and that there was a lot was leftover too. Everybody from our side of the extended family asked for the leftovers as well the next day and not a single ball of kofta was wasted, huge wastage of such stuff is otherwise so common when you cook things for a large party. I still feel proud about that cooking marathon as I had cooked many other dishes apart from this kofte, and that cooking experience made me confident forever. I could cook for large gathering without thinking twice about how would I go about it, you do less mistakes when you are confident and your eyeballing the ingredients works well. I still make these kofte in large amounts most of the times, to last three days at least and the remaining 2 portions of dry kofte is frozen for later use. 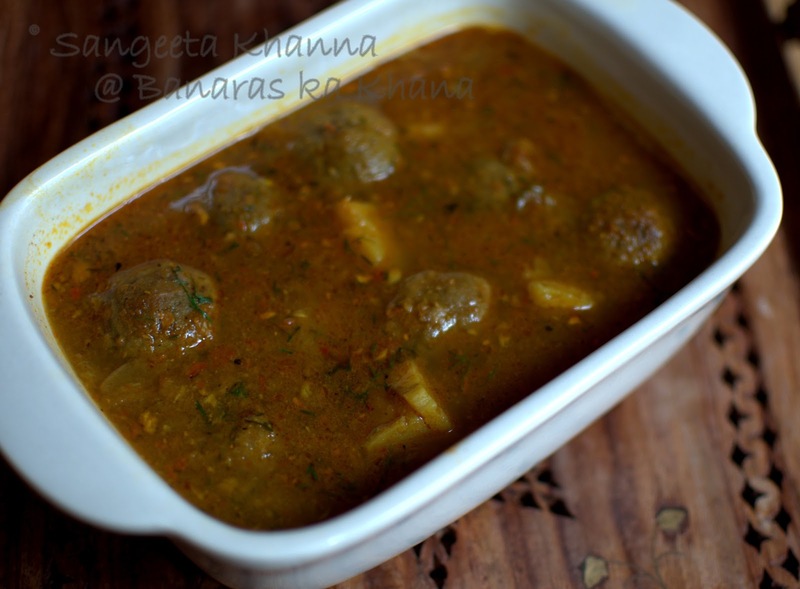 It becomes a lot more easier when you have a bhuna masala in the fridge and some dry kofte in the freezer. Just mix the two, add water and simmer till soft. Do not peel the bananas, just remove the stalk, remove any blackened skin, cut in slices and boil in a pressure cooker with a little salt up to 1 whistle......let it cool to proceed. You can always use a food processor or chopper for mashing this boiled plantain. Chop the onions and then the ginger garlic n green chilies in the same chopper one by one. Mix in other ingredients except oil and make a pliable dough like mixture. Divide into balls and deep fry in hot oil. Note that if they break into hot oil it means they need a bit more of besan added. So correct the consistency before you fry all of them. Fry all the kofta balls and keep the extra in the freezer if that is the case. Heat oil in a pan and throw in the cumin seeds. When it splutters add the chopped onions and fry it till golden brown. Add the ginger garlic paste and fry till oil separates. Throw in all the powder masala, salt and tomato puree and mix well. Cook covered till oil comes on top, mixing in between. Add about 1 cup of water and give it a boil. Sslip in the kofte (1/3rd of the above stated quantity for this much gravy) and switch the flame off. Do not disturb the kofte till they absorb water and grow bigger in size. 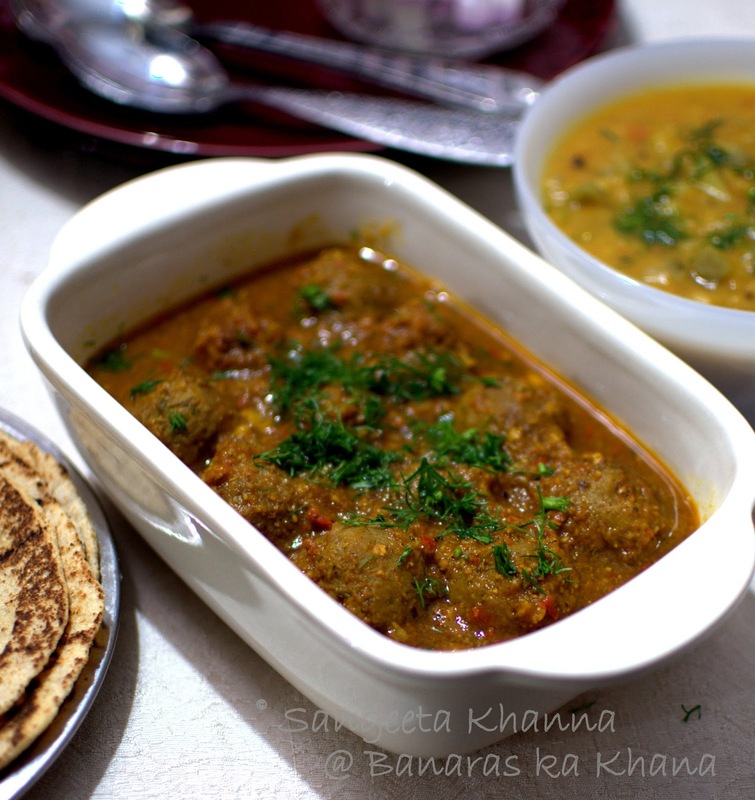 Garnish with coriander leave, transfer carefully in to a serving dish (the kofte can break while doing this) and serve immediately with roti, paratha, naan or any rice preparation, we had it with plain rice in the below picture. To prevent these kofte from breaking after putting them into gravy just arrange all the kele ke kofte into a casserole dish. Pour the gravy over it and microwave for 2 minutes. Serve immediately after this. Add fresh cream in the last step if it has to be served for a party For the two of us I avoid adding cream. Thanks for visiting me. I read this in a magazine but did not give it a try. It looks ravishing. Will give it a try next time I buy kachche kele. My mom used to make this very frequently when we were growing up. brings back a lot of childhood memories! Thanks Sangeeta for sharing such recipes . 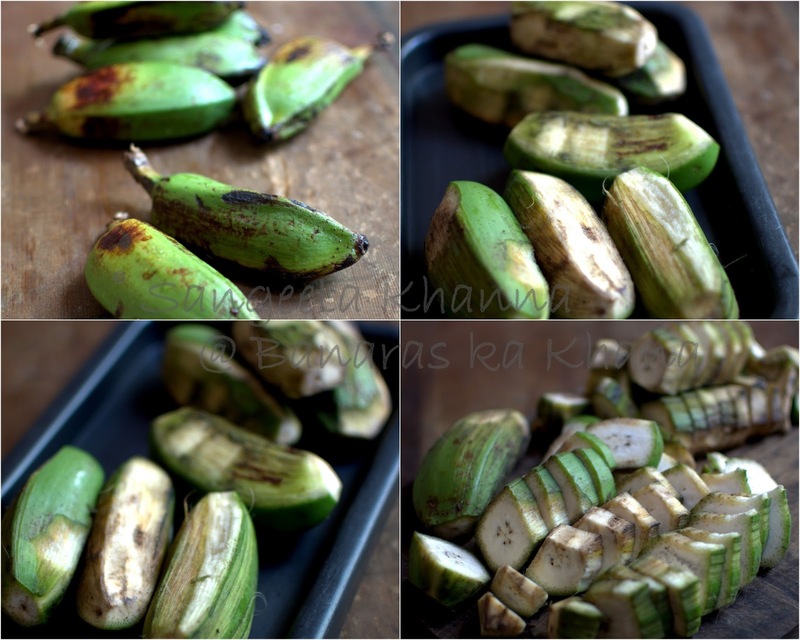 Wud b making this tomorrow, just wanted to knw tht cooking with the peel will not affect the taste,as never done or heard it,just a bit curious to knw. The peel doesn't affect the taste but actually improves the texture a lot. I make chutney with only the banana peel and it tastes delicious. So don't worry about the taste of the peel. Thank you so much for the recipe feedback Sunita. Kele ke kofte is probably the only kofta that I make at home, others are rare. What other recipe you want? looks like you entered the comment before completing the sentence.